Industrial kitchens produce considerable amounts of heat with their burners, especially when busy. The ventilation fans and ducts have to cope with this. Wall hoods operate where cookers are placed against a wall and single island hoods for stand alone cookers. Canopies cope with a great deal of heat and stainless steel is the best material for this. 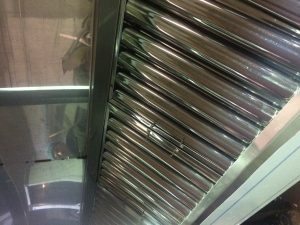 Watch the video below to see why stainless steel extraction canopies are such a vital part of the commercial kitchen ventilation system. Did you know that commercial kitchens can produce carbon monoxide – a lethal colourless odourless gas? Or that they can release particles that can trigger respiratory illnesses? An industrial extractor fan is not just for improving the working environment; it is a necessity for safety and the health of your staff and customers. 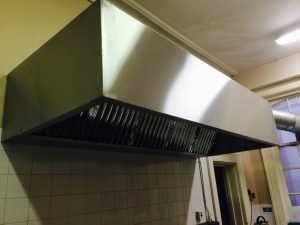 Kitchen ventilation in a commercial kitchen environment is crucial as well as a legal requirement. 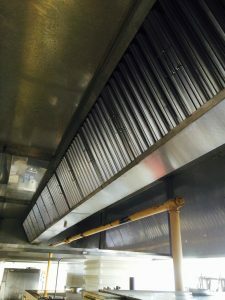 A Commercial Kitchen Extraction Canopy contains a hood with edges that extend beyond the cooking area, so the canopy catches the contaminated air at source, preventing it from moving elsewhere. 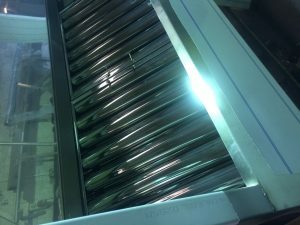 The kitchen extract canopy contains filters to remove particles and grease, to avoid any buildup in the air inlets. The ventilation system also has ducts for fume discharge and to allow fresh air into the kitchen. Fans move fumes from the hood to the ducts. It’s also important to maintain your kitchen extraction canopy because if you have a fire and your ventilation system has not been maintained, your insurance company will contest any claim you make. Professional cleaning for commercial extraction canopies is recommended, as the canopy extracts grease from the air, making it a fire hazard if not regularly cleaned. 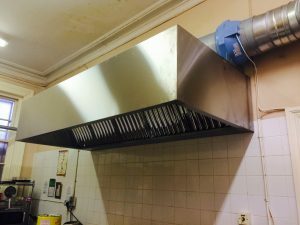 As well as collecting fumes and poisonous gases, commercial kitchen extraction canopies filter out carbon and grease from the air. This is another health and safety feature, as grease-filled air is a common cause of commercial kitchen fires. These are especially common in kitchens where a lot of frying or wok cooking is done.